I have eight days of school left. EIGHT DAYS. One part of my brain is chanting happyhappyjoyjoy and the other part is becoming really emotional. (Warning!) I will probably write an unnecessarily long post about it in a couple weeks. Friday my school had a field trip to Carowinds, but because the trip is expensive, the majority of my students didn't go. Many stayed home, and some (of my favorite kids!) came to school. Since all the other students were doing fun things, we didn't exactly want to spend the whole day in the classroom, so we set up a mini soccer tournament and played some pretty intense uno and I taught them how to play catchphrase and apples to apples. It was fun, and I realized how much more I like some of my students when I'm not responsible for their education. It's a little late for that realization, I know. Anyway, since I've been kind of nostalgic lately, I decided to do one of my favorite childhood activities this weekend. 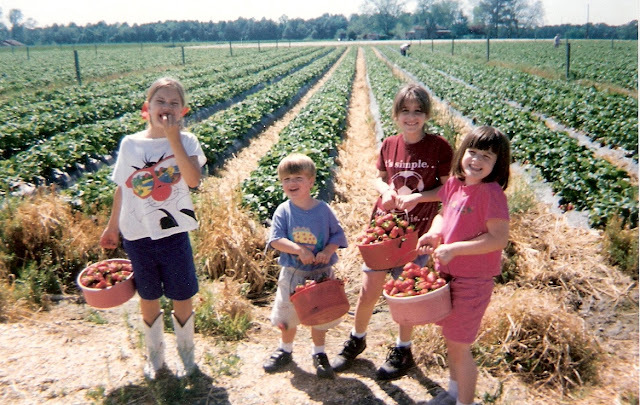 To add to my overly emotional state, I discovered that the strawberry farm I grew up going to every year had recently closed. We went to Smith's Nursery instead, which turned out to be almost as wonderful. It was a BEAUTIFUL day outside and I was as happy as I could be. I dragged Adam and his brother along, and while they weren't super enthused at first, they had fun in spite of themselves. Growing up, whenever we'd go strawberry picking, we would come home, help my mom cut and clean all the strawberries, and then make strawberry bread. This is one of those recipes that my mom has had forever. We make it the same way, every year, with no changes. I didn't exactly want to change up something that was already perfect, nor did I want to break any of my mom's rules of baking, but in my opinion the ratio of sugar to flour in this bread was pretty high, especially considering it's more of a breakfast food than a dessert and I have a tendency to eat three slices of it in one sitting. I eventually decided to cut out half of the sugar and replace it with mashed ripe banana. Traditions are important, but sometimes it's fun to add your own twist. Preheat oven to 350 degrees. Prepare two 9 by 5 by 3 inch loaf pans by greasing and flouring. Make a well in the center of mixture. Combine banana, eggs, vanilla, canola oil and water in a medium sized bowl. 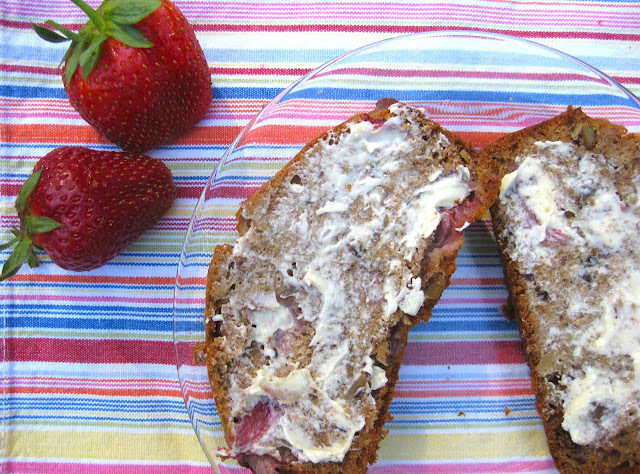 Add in the strawberries and walnuts, then spoon mixture into 2 prepared loaf pans. Bake for 50-60 minutes until top is golden brown and toothpick comes out clean. Cool loaves in pans for about 10 minutes, then remove to wire rack and cool completely.